Who are they in this Photo? I came across this interesting photo on my visit to the Salar Jung museum in Hyderabad. These two little princes with their ornaments and little sword totally stole my heart! 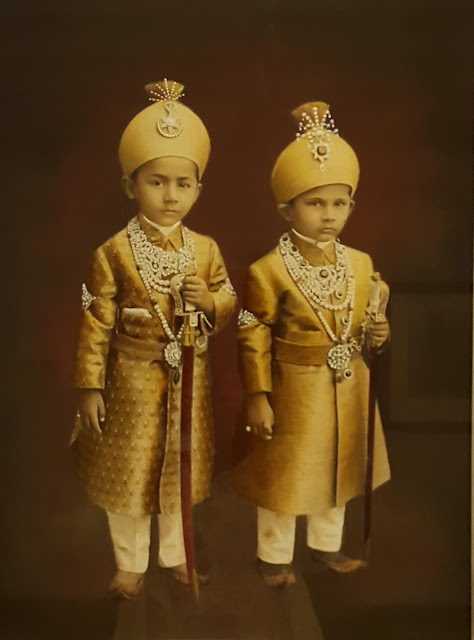 It is the portrait of two infant sons of the seventh Nizam of Hyderabad. They are Sahebzada Azam Jah and Sahebzada Muazzam Jah. I was drawn to the mischievous yet poised look. It was cute and elegant at the same time. You will be amazed to know the full name of Azam Jah. It is "Azam Jah, Damat Walashan Sahebzada Nawab Sir Mir Himayat Ali Khan Siddiqi Bahadur Bayaffendi" including all his honours. He was the eldest son of the seventh and last Nizam. Eventhough he was next in line to the throne, due to British rule and the Indian independence, he did not receive the kingdom.